The art which was selected for the Special Merit Category (Artists in Alpha Order from A thru Ko) is any art from the various media categories that we believe could have also been placed in the top tier of the entries selected. The only reason that this art was not selected for the top tier was due to the size constraints of this particular competition. 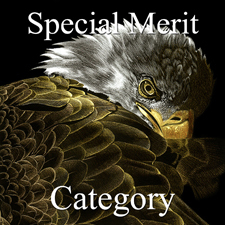 Otherwise, the Special Merit art, in many cases, is interchangeable with any of the best art that we selected elsewhere. The Special Merit awards are being selected from the three media categories. All winning entries will now be featured on the Light Space & Time website for the month of June 2016 and thereafter, the artworks and the links to the artist’s websites will remain online in the Light Space & Time Archives. Congratulations to our artists who made our 6th Annual “Animals” Art Exhibition so successful this month. At any time, we invite our winners and other interested visitors to link their websites to the Gallery’s archive page for further ongoing promotion. The Light Space & Time Online Art Gallery will have “Animals” Award Certificates, Event Postcard and Press Releases sent to you within the next week or so. Thank you for being part of the gallery. The artists who have been recognized in the Special Merit Award Category are divided into 2 groups of artists and they are in alpha order. Special Merit Artists A thru Ko (Below this Paragraph) and on another page are the Special Merit Artists Kr thru Z.